Antoine Griezmann’s been the subject of rampant transfer speculation for the last year-plus, and Manchester United’s interest in the little Atletico Madrid striker has been anything but a secret. Reports of personal terms being agreed, Paul Pogba convincing his countryman United is the place to be, and even his image consultant making googly eyes at United have lead many to believe that’s where he’ll end up next year, but Griezmann himself has put a damper on the premature talk of him leaving. “With Real Sociedad, I felt that I needed to leave. For the moment, I do not know where that desire came from,” Griezmann told RMC. Griezmann’s in an interesting position right now. He’s at a legitimate Champions League contender in (possibly) the world’s best league, and he’s under the tutelage of one of world soccer’s very best managers in Diego Simeone. He doesn’t have much incentive to leave aside from a bigger paycheck and/or a new challenge in a new league. And even that doesn’t seem like it’s super important to him. “Aside from that, I am asking myself where I could go. In Spain, there is Barcelona and Real Madrid. “Barcelona have the three [Neymar, Lionel Messi and Luis Suarez] up top. Real Madrid, that is impossible because of the club I am at [hated rivals Atletico Madrid]. I think that between them, there is a pact [not to conduct transfers between the clubs]. “Germany, the league does not attract me much. France, not for the moment. What… does that leave? Serie A didn’t even get a mention, so it’s safe to assume he’s probably not heading to Italy. Other than that? 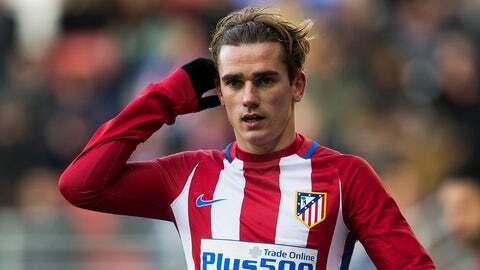 Griezmann is 26 years old, at the top of his game and highly coveted by the world’s best, so he’s likely not moving to China either. So there really aren’t too many options. Maybe he’s staying? Or maybe he’ll get over his dislike of the rain and make that United move happen. But given his statements on the subject, it’s not quite the lock many of us believed it to be.